The Le Creuset Braiser is great for Ratatouille. (or any large wide, shallow pan). 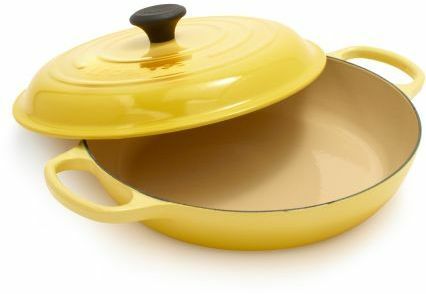 You know what a nut I am about the braising pan, but it’s summer, so you’d be right to wonder if this big kitchen buddy—perfect for meaty roasts and stews— is collecting dust during summer. • What is a braiser? • Where can I find more great recipes for my braiser. If you don’t own a braiser, you can still make this recipe. Just use a large, deep skillet or a Dutch oven. 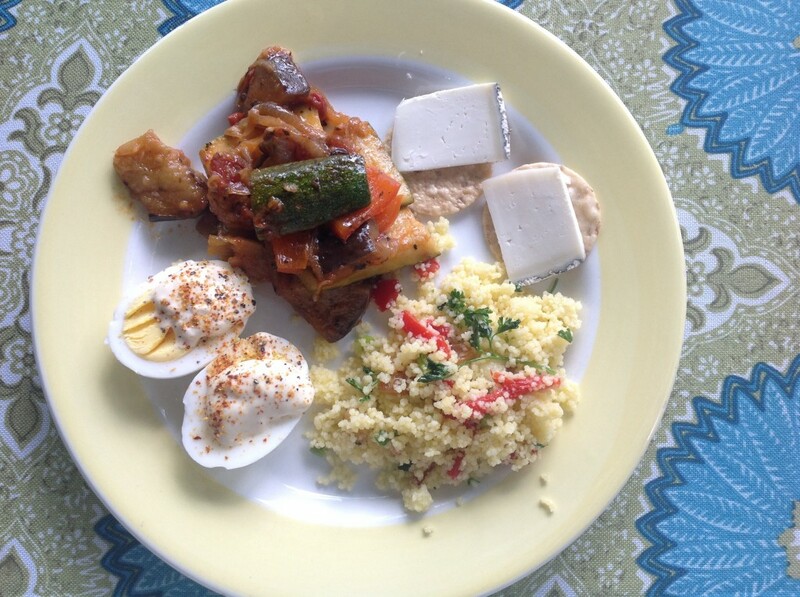 One of my favorite was to serve ratatouille—with couscous salad, oeufs-mayo, and a couple crackers with French cheese. 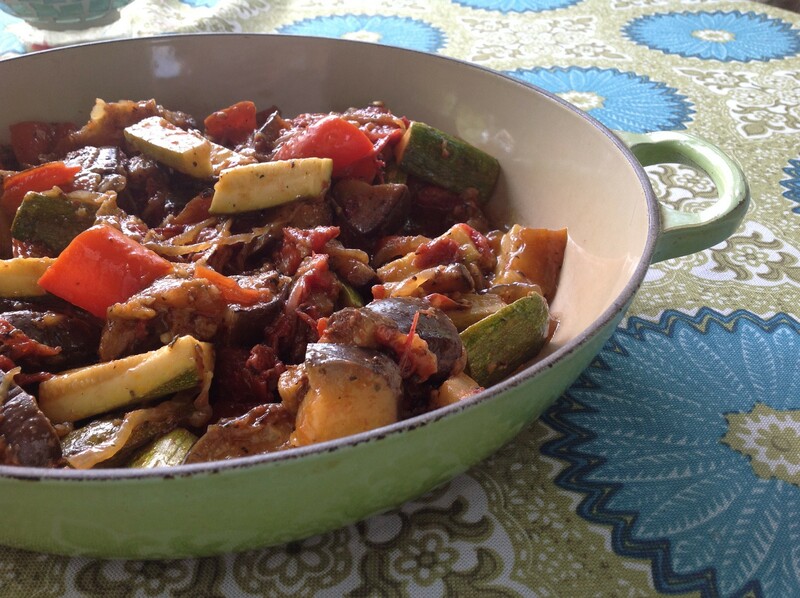 Find other ways to serve ratatouille. 1. In a 3 1/2-quart or 5 -quart braising pan, heat 2 tablespoons of the oil over medium/low heat. Add the onions and cook, stirring occasionally, until tender and starting to turn golden, 15 to 20 minutes. Add the bell peppers, garlic, and salt and pepper and cook, stirring occasionally, until the peppers soften a bit, about 10 minutes. Add the tomatoes and herbes de Provence. Increase the heat and bring the mixture to a boil; return the heat to medium-low and cook, stirring occasionally, for 15 minutes more. 2. Meanwhile, heat 3 tablespoons oil in a 12-inch skillet over medium heat. Add the eggplant and cook, stirring, for 8 minutes. Add the zucchini and the remaining 1 tablespoon oil. Cook, stirring occasionally, until the eggplant and zucchini are crisp-tender, about 5 minutes. Season with salt and pepper. 3. Add the eggplant and zucchini to the tomato mixture in the braiser and simmer gently until the liquid is reduced to a tablespoon or two, 5 to 10 minutes. Check the seasoning, adding more salt and pepper if needed. 4. Serve warm or at room temperature. Or, chill overnight and bring to room temperature to serve. Serves 6. The Le Creuset Braiser. Love this thing. Check out these related products from Amazon—shopping through these links helps support this site, without costing you any more money whatsoever. Thanks for your consideration! • The Braiser Cookbook: 22 irresistible recipes created just for your braiser-great for Le Creuset, Lodge, All-Clad, Staub, Tromantina, and all other braiser pans. 12 comments to Use That Braiser for….Ratatouille! Wini,, you reference a bouquet garni in the instructions, but I don’t see it in the ingredients. Could you please clarify? Thanks! Good heavens. I need an editor! Thanks for catching that. I decided to use herbes de provence instead of a bouquet garni. I love a bouquet garni, but I wanted to streamline the recipe a bit….it’s summer, after all! Thanks. I’m fixing that. Yes! At this point, you just want to get everything cooked and melded, so low heat, along with watching it closely and stirring it, should do the trick. Great question, Beth. Thanks. Great additions–thanks so much for the nice comments on the book. I’m glad you like my version–I’ve been enjoying it for about 3 days now myself! I love my Le Creuset braiser ! My Mother gave it to me probably 25 years ago and it is certainly a staple of my kitchen… and now, I am going to try your ratatouille ! Wow! I didn’t know that the braiser has been around 25 years. Do you salt and squeeze the eggplant before you cube them or is that not necessary fpr this dish? No, I do not! I’ve always found that step to be too much trouble for the small amount of benefit. We still have both oregano and basil in the garden. can either of these (or both) be used as a substitute or along with the herbs de provence? Sure thing! Use both. The recipe will swing slightly Italian, but it will still be fabulous!